>In my June 6 column, "The Lies Grow More Audacious," I mentioned that Obama and the British prime minister, who Obama has as a lap dog, just as George Bush had Tony Blair as lap dog, had managed to celebrate the defeat of Nazi Germany at the 70th anniversary of the Normandy invasion without mentioning the Russians. I pointed out the fact, well known to historians and educated people, that the Red Army defeated Nazi Germany long before the US was able to get geared up to participate in the war. The Normandy invasion most certainly did not defeat Nazi Germany. What the Normandy invasion did was to prevent the Red Army from over-running all of Europe. As I have reported in a number of columns, many, if not most, Americans have beliefs that are not fact-based, but instead are emotion-based. So I knew that at least one person would go berserk, and he did. JD from Texas wrote to set me straight. No one but "our American boys" won that war. JD didn't know that the Russians were even in the war. In 1973 a British television documentary series was released that chronicled WW II. Of the 28 episodes, only three and a part of a fourth acknowledge Russian participation in the war. From the British standpoint, victory was an Anglo-American victory. This did not sit well with the Soviet government. The Soviets offered their film archives to the West. In 1978 a 20-part series of 48 minutes per episode was released in an American documentary television series narrated by Burt Lancaster. The documentary was titled: "The Unknown War." The Unknown War was a revelation to Americans because it demonstrated beyond all doubt that Nazi Germany lost World War II on the Russian front. Of the 20 episodes, "The Allies," that is, the Anglo-Americans and free French, feature only in number 17. One out of 20 is about the correct proportion of the West's participation in the defeat of Nazi Germany. If you google The Unknown War you will find an entry on Wikipedia. The series might still be available on YouTube. It was taken off the air when the Soviets invaded Afghanistan, a folly repeated by dumbshit Washington. It was more important to Washington that Russia be demonized than any truths should be presented, so the truth revealed in The Unknown War was removed from US TV. Later the documentary reappeared on the History Channel. In my June 6 article, I said, following the consensus of historians, that Nazi Germany lost the war at Stalingrad. In this article: historian Dr. Jacques R. Pauwels says that Germany lost the war 14 months earlier at the Battle of Moscow in December 1941. He makes a good case. Whether one agrees or not, the facts he presents are eye openers for the "exceptional, indispensable Americans" who believe nothing happens without them. At the 70th annual Normandy landing celebration in France, Obama informed his French vassal, President Hollande, that he, Obama, the ruler of the Exceptional Country, would not sit down to dinner with the Russian Putin. Americans are too good to eat dinner with Russians. So Hollande had to have two dinners. One for Obama, and then one for Putin. As food is still good in France thanks to the banning of GMOs, probably Holland didn't mind. I myself would have enjoyed being at both dinners for the food alone. Like all news that is important, the dinner for Putin, and its meaning, escaped the attention of the American presstitute media, the world's greatest collection of whores. 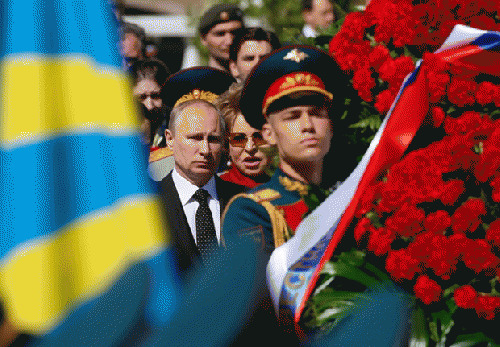 If memory serves, normally the Russians are left out of the Normandy commemoration celebrations. If the war was won in the West, what did the Russians have to do with it? Nothing, of course. "Our boys" did it all, just as JD informed me. Russians? What Russians?